Photo 3: David L. Zwiers, Jason Griffith, & Ryan Stadler (All photos by Katherine McPherson) “AS IS” Returns to the New York City Stage for 25th Anniversary! William M. Hoffman’s groundbreaking “As Is” is largely credited as the first widely-seen play to tackle the subject of AIDS. The provocative theater piece was Winner of the 1985 Drama Desk Award for Outstanding New Play, and was nominated for a Tony Award that same year for Best Play. A movie version of “As Is” also aired on cable TV in 1986. At the time Hoffman‘s play first appeared on the Manhattan stage, HIV/AIDS was largely a brooding enigma– a new epidemic marked by fear, lack of knowledge, and virulent homophobia. “As Is” focuses on the impact of the disease through the lives of its two main characters, New York City natives Rich and Saul. Rich, a successful author, has just announced that he has AIDS. Reactions from those close to him– including his business partner, his brother, and his lover Seth– are sadly yet predictably adverse. This was the time, after all, when AIDS was widely known as “the gay plague”, and many believed that the illness could be spread through casual contact or even through the air. Rich finds unconditional friendship and support from Saul, his ex-lover. Together, they deal not just with Rich’s dubious health but also with the aforementioned issues– fear, uncertainty, and prejudice — that go along with having the virus. Twenty-five years after its debut, “As Is” is being revived at The Studio Theater at New York City’s Theater Row. To state the obvious, the face of HIV/AIDS has undergone many changes in the past quarter-century– from what we know about the virus itself to the course that it takes on many people living with it. Changing sensibilities (and 80’s style wardrobe…) aside, “As Is” is as socially relevant and as resonant with audiences as ever in 2010. 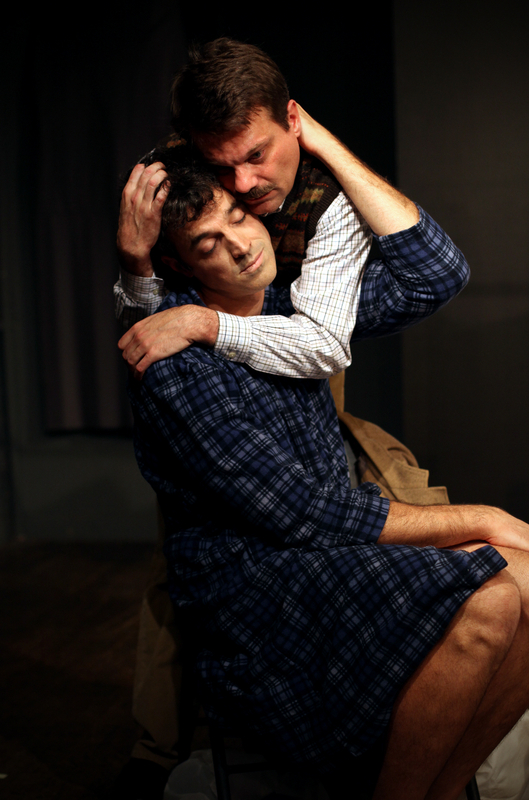 The dynamics of the relationship between ex-lovers Rich (Jeff Auer) and Saul (Todd Michael)– no longer sexual but still very intimate, often intense and frequently playful– are genuinely authentic… and make for some truly timeless moments of theater. The conflict faced by many gay men in New York City today– the desire to enjoy their sexuality openly with the specter of HIV lingering in the background– has not changed much through the decades. And perhaps most importantly: While we may have become more educated about HIV/AIDS since 1985, the stigma of having the virus still very much exists in 2010 . The smooth, tight direction by Walter K. Hoffman (no known relation to the playwright, by the way) is a major asset, and the acting by the entire cast is superb. The AIDS support group scene is a seen is a fine example of ensemble acting — mostly wordless acting, at that– at its best. It’s an accomplishment of both the playwright and the director that even with the play’s subject matter, there are many moments of levity and even laugh-out-loud humor. The two leading men are standouts. As the wise-cracking, animated Saul, Todd Michael has the more showy role for a great deal of the play. Jeff Auer‘s Rich is more staid and tightly wound, but we can see that his character is a Pandora’s box of emotions just on the verge of busting open. When that does eventually happen later in the play, the effect is no less than explosive. The 90 minutes of “As Is“ are framed by monologues by Emily King Brown (a revelation), who plays an ex-nun now working in a hospice at New York City’s St. Vincent’s Hospital. Envisioning herself as something of a modern-day saint, she waxes poetic about life and death. But in between the two, there’s a whole spectrum of universal human emotions and ageless themes– including but not limited to joy, hope, passion, survival, friendship, and love. “As Is” captures much of that spectrum… and this new production captures it, I might add, very well. “As Is” plays at The Studio Theater at Theater Row, 410 42 St. Performances are Thursdays and Fridays at 8PM, Saturdays at 2PM and 8PM, and Sundays at 3PM through Oct. 31. Tickets are $15. Go to Telecharge at (212)239-6200 or www.Telecharge.com for tickets. Visit www.AppleCoreTheaterCompany.org for more info. “As Is” Playwright William M. Hoffman and Director Walter J. Hoffman spoke to Jed Ryan about Apple Core Theatre Company’s 25th Anniversary revival of “As Is“. JR: Congratulations on the revival of “As Is”. In 2010, twenty-five years after “As Is” made its debut, what do you believe is the most enduring aspect of the play? William: In America, as well as the rest of the world, AIDS has not disappeared. Millions of people are still being infected and are still living with and dying from the virus. So my story of one man who is dealing with this disease still has resonance and currency. Fortunately, these days we have treatments which have extended the life of those who come down with the disease. In this country, where we have access to these medications, my play can be viewed now as a play, as well as the political statement that was implicit in the original production. Much as the world now views Ibsen’s play “Ghosts,” which was written at a time when syphilis was ravaging the world, and Verdi’s opera “La Traviata,” whose heroine dies of tuberculosis, more as works of art and not as documents of protest, I believe “As Is” can now be seen more as the dramatic vehicle that made the work so popular. Walter: I really believe that “As Is”’ most enduring theme is that of one man’s struggle for dignity and survival in the face of, what seem to be, insurmountable odds. The theme of one person’s struggle, or a group of people struggling, against forces beyond their control is as old as drama itself. It goes back to the earliest Greek tragedies, through Shakespeare, and right up to our greatest American dramas by Arthur Miller, Eugene O’Neill, and Sam Shepard. So, I guess you could say the reason “As Is” holds up so beautifully is that the play has a real foundation of over 2,000 years of drama behind it. Times and styles may change, but when something is built properly and with care, an audience finds it easy and enjoyable to take in a story– regardless of how much time has passed from its’ original creation. JR: The perception of HIV and AIDS, as well as the destinies for people living with the disease has changed drastically since AIDS first made headlines. For younger audiences– let’s say, men and women in their 20’s– who don’t remember the AIDS hysteria of the 80’s, what will be the biggest eye-opener and/or provocative moment of “As Is”? William: The biggest eye-opener would probably be how the first appearance of AIDS terrified the entire population. We had all forgotten that human history might easily be viewed as an account of the wars and plagues that have ravaged us, much as the Bible recounts our ancient history. Walter: It’s true that the medical advances have been astounding in the past twenty-five years. However, after last year’s health care debate and with over 40 million Americans uninsured, I don’t think any person, regardless of where they were in 1985, will find it hard to relate to someone who has a disease that could take his life, and finds himself with few friends and no money. Also, let’s not forget, that they don’t give away the drugs that keep people suffering with HIV/AIDS alive. They cost a lot of money and that means you need to have insurance or get aid from the government to pay for them. Just because the drugs are out there doesn’t mean that it’s all nice and pat once you get them. There is still no cure for AIDS and people suffer from many complications from the disease, even if they get the meds. To answer the question more succinctly: I think the biggest eye-opener may come when people realize that things haven’t really changed at all. JR: For those potential audience members who may not want to see a play about a person with AIDS because they feel, for lack of a better word, that it’s a “downer”, what would you tell them? William: “As Is” veers between the poles of tragedy and comedy. That was my method of dealing with what, at the time, seemed a hopeless situation. It usually has people both laughing and crying, sometimes both at the same time. Walter: At the end of the day, the story “As Is” portrays is that of a man striving, searching, and fighting for a way to live. If we can say that the protagonist of the play, Rich, represents LIFE and that AIDS represents DEATH, then I would say that– opposed to something “down” and “dark”– then what you will be witnessing is a battle between those two forces that causes a great friction and brings a light that shines through all the pain and suffering which leaves everyone with a feeling of hope. JR: Walter, have you taken any artistic liberties with the new production? Put another way, how faithful have we kept this new production to the original? Walter: In all honesty, I think we have tried to keep this production as faithful to the original as possible. There has been absolutely no updating of language or content. In terms of artistic liberties, the only things that we’ve done have been in the downsizing department. “As Is” was a show that was on Broadway, and we just can’t compete with Broadway production values. For instance, in the original production, the ensemble actors would change costumes on stage: They had enough space and enough lighting to dim vast parts of the stage for costume changes, which made the changeovers between scenes absolutely seamless. There’s no way we could even think of doing that, so we have the actors changing offstage doing more traditional changeovers in between scenes. However, even on Broadway, “As Is” was an intimate show, so downsizing it seems very natural. JR: Historians have said that the perceptions of HIV and AIDS, as well as perceptions of people living with the disease, have been heavily shaped by the media (TV, movies, pop culture, etc.) through the years. Where do we stand now, in 2010, with the subject of HIV/AIDS and the media? And, where does “As Is”, one of the first plays written about the disease, fit in with this? Walter: The subject of HIV/AIDS is in the media fairly regularly. However, that coverage usually has very little to do with what’s going on in the United States. South Africa and parts of Russia seem to get the most attention at this time. The focus on those regions is entirely justified, as that’s where the disease is spreading fastest. However, the coverage of AIDS usually stops there. It’s almost as if, according to the general media, AIDS is somehow “over there” and no longer a problem right here at home. It has been estimated, by the Centers for Disease Control, that somewhere between 15,000 and 20,000 people die from AIDS related causes each year and that there are around 40,000 new cases of HIV/AIDS every year. The low number for people living with HIV/AIDS is around a half a million, but it is estimated that it could be twice that high. Although people with AIDS are living longer over here doesn’t mean that it’s still not a very serious problem. It seems though that the media is not very interested in covering the disease as it is over here in 2010. “As Is” stands, and will always stand, as a defiant humane call for dignity in the face of what was thought to be an unstoppable and incurable disease. “As Is” drew attention to the plight of those who had no voice and made people aware of what was happening. The gay community at that time had very few friends in the media or the government. Press coverage was almost non-existent, and it was a taboo subject politically. The gay community had to unite wholeheartedly and stare down this deadly and insidious disease all by itself. The arts were one of many weapons that it used to fight against the disease and for more fair treatment from the press and government. “As Is” is one of the crowning achievements of that movement. It really is an awesome accomplishment. JR: William, when “As Is” made its debut, was the play considered controversial because of its themes, specifically gay relationships and AIDS? William: When I first wrote the play, the world was in total denial about the new disease that had suddenly erupted. As typical with society’s handling of frightening situation, many people became obsessed with blaming the victims rather than dealing with the problem at hand. AIDS was the fault of gay men, Haitians, etc. Until the time that my play and Larry Kramer’s “The Normal Heart” broke through the barrier of dealing with AIDS, the disease was a taboo subject, than neither the left nor the right dared to deal with. JR: William, having seen your play being performed many times, is there a particular scene or moment in the play that never fails to get a big reaction from the audience? William: The turnabout in the relationship of Rich, the man who has AIDS, and his family usually affects people deeply, as does the scene where Rich begs his partner Saul to do something Saul is absolutely unwilling to do. JR: Thanks, gentlemen! Here’s to a successful run! Previous ‘‘CHO DEPENDENT”: Margaret “F***ing” Cho Sings! Next The “OH!” in Ohio: Mike Greisinger, Mr. Ohio Leather 2011, Talks About His Upcoming Reign.